The LFO section delivers rhythmic sweeping modulations that animate the filter. It operates the same way as the original, but with a wider frequency range. The Drone Commander’s LFO modulations are based on a slow ramp waveform that sweeps the filter. The ramp can be set for rising or falling slope, and the SHAPE knob crossfades the ramp modulation with a simple ‘blip’ at the end of every LFO cycle. The other half of the LFO section is a unique phase-locked loop (PLL) that tracks the LFO, generating a pulse wave that automatically synchronizes at a frequency of 2x, 4x, 8x, or 16x. The PULSE knob adjusts the depth of filter modulation by this waveform. 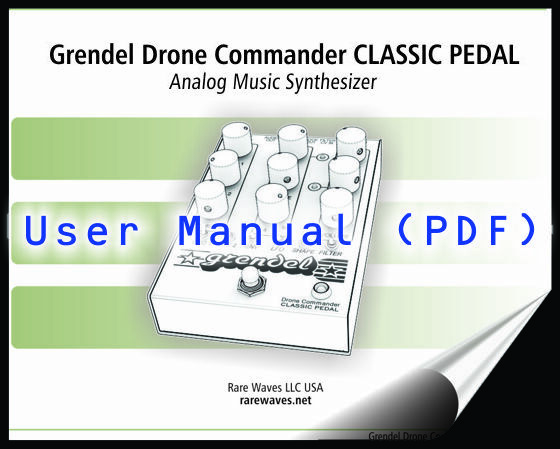 Get new sound effects by processing external audio signals through Grendel Drone Commander’s filter and LFO, via its 3.5mm monophonic line input jack. No, because it creates its own sounds, and its not intended to be patched in the middle of a chain of FX pedals. There isn’t a dry signal path from Audio In to Audio Out. It can process audio like an effect, but please see the user guide for how to do that best. Also, the stomp switch isn’t a wet/dry bypass switch. Instead, the stomp switch is used to mute/un-mute the output and trigger fade-ins and fade-outs. Why doesn’t it have a ¼” input and a straight-through wet/bypass switching like an effect pedal? 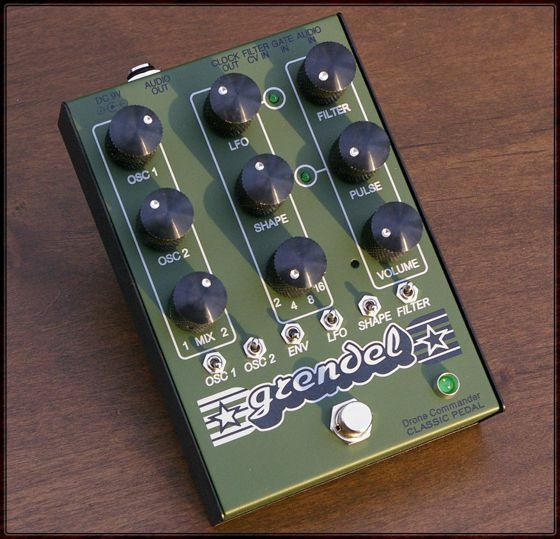 The simple answer is that Grendel Drone Commander wasn’t developed as a guitar effect, and we don’t feel like that it particularly shines in that role. Nevertheless, to satisfy the curious and experimentally savvy, this model has an Audio In, and it is possible to pipe a guitar signal through it with simple audio adapters. If your amplifier has two inputs, simply connect the Drone Commander to an unused input on your amp. Patch in some extra effects for it along the way. 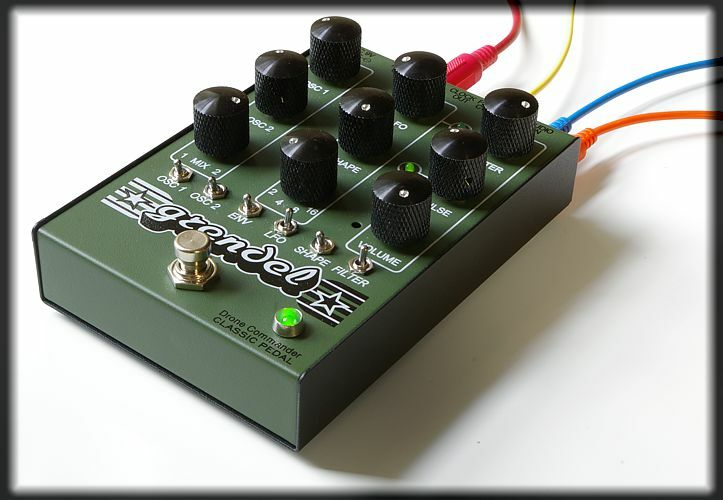 Use the Drone Commander’s stomp switch to bring its sound in and out when you like. CLOCK OUT: Synchronize external gear with the Drone Commander’s pulses. This port sends a square wave analog clock output. AUDIO IN: Patching to this port mutes the internal oscillators, and substitutes external audio. The external signal passes through the Drone Commander’s filter, LFO, and Gate effects. Typically for best results, use a signal with constant dynamics, such as the raw waveform output from a VCO module. Or, experiment by connecting other instruments to it. See the user guide for more info on patching the Audio In jack. Q. Can it be modified with different features? A. Rare Waves LLC USA does not offer or support modifications for this unit.